Dundee and Dundee United's plans to build and share a new stadium have been put in doubt in the wake of Scotland and Ireland's failed bid to co-host the Euro 2008 finals. Now the two clubs will ask their fans if they should go ahead with the existing proposals or not. The clubs wrote to the Scottish Premier League in September to ask for permission to groundshare in the future. And Aberdeen, who already have a controversial planning application for a new ground lodged with the Scottish Executive, are also having to rethink their own plans to leave Pittodrie. The Scotland and Ireland bid for the 2008 finals had proposed group matches to be staged in two stadia outside Glasgow and other than Edinburgh's Murrayfield. An upgrade of Hibernian's Easter Road was a possibility. But plans had also been drawn up in Dundee and Aberdeen for new grounds that would have been partially funded by public money. That could have seen Dundee and Dundee United sharing a ground, although that is not currently allowed under Scottish Premier League rules. Now, following today's confirmation that the finals will be held in Switzerland and Austria, both projects are in jeopardy. Dundee United spokesman Malcolm Brown said: "We will now have to sit down with everyone concerned and begin a new consultation process in the knowledge that Euro 2008 is not going to happen. "We will have to look at the possibility that Scotland may bid for Euro 2012 and assess the implications that might bring. "However, I can confirm that we will be taking the supporters' views into account." Dundee spokesman Niall Scott confirmed that consultation with the Dens Park supporters over the way forward would also be top of the agenda. He said: "It's not a case of going back to the drawing board though. "At Dens we want to sit down with our fans to work out how we apply many of the lessons learned to the future of our club and football in general. "A new stadium for Dundee remains not just a possibility, but an opportunity we should take very seriously." 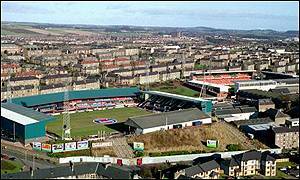 Aberdeen have already spent �300,000 on their plans to relocate to Bellfield farm in the Kingswells suburb of the city. But some residents there have mobilised themselves into a protest group to block the plans. Dons spokesman Andrew Shinie said: "We are obviously very disappointed that the Scotland-Ireland bid has been unsuccessful. "The benefits which could have been derived for Scotland's economy as well as Scottish football were significant. It is a blow to all concerned." But he added: "The planning application is now with the Scottish Executive, which is undertaking a public inquiry. "In the coming weeks we have meetings with our professional advisors to make a decision on our strategy for this inquiry. "There is no timescale for the outcome of the inquiry at the moment. "We still believe that the proposals for a new stadium and world-class sports and leisure facility at Bellfield present an outstanding opportunity for the north-east and we need to consider how we best move this forward." Will 2008 be a success?